Four years after the death of benefactor Robert Ogden, the Ogden College opened in Bowling Green. Provides free education for white males in Warren County and is open to all white males. 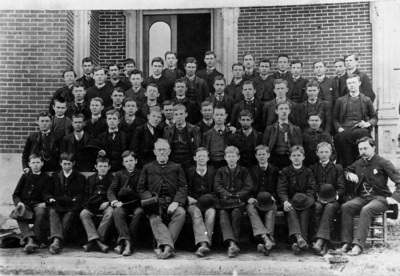 This photo shows the Ogden College student body in 1888. Front row l to r: 3 unidentified, Proctor Barclay, unidentified, Allen Wood, Clarence Claypool, 2 unidentified, Percy Sullivan and unidentified. 2nd row l to r: John Rochester, Jesse Spaulding, unidentified, A.T. McCormack, Bobby Wilford, Ben Covington, Charles Nahm, unidentified and Ed Calvert. 3rd row l to r (left half of photo): Sam Bland, W.E. Overstreet, Ennis Harris and 2 unidentified. 4th row l to r: Watt Brom, Hugh Murrey, Lewis Elgin, unidentified, Harry Potter, Joe Perkins, Runey Beauchamp, unidentified, Edgar Grider and unidentified. 5th row l to r: Richard Thomas, H.L. Hindrick, Jack Russell, Charles Mitchell, William Shutt, George Chapman, Jonathan Rodes, William McElroy and William Gaddie. 6th row l to r: unidentified, Getty Snell, Oscar Bloch, Rufus Oliver, Walter Chapman, O.P. Anderson, unidentified and Watt Brom. If you recognize this photo and can help identify the people in it, please contact archives@wku.edu.